People's Artist of Russia (2001), presently Artistic Director of Ballet of the Bolshoi Theatre of Russia, premier of the Bolshoi Theatre Ballet, international ballet star, member of the jury of two ballet contests — Youth America Grand Prix 2010, USA, and TanzOlymp Berlin 2011, Germany, President of The Arts Center Ballet Traditions. Born on October 27, 1970 in Moscow. In 1988 successfully graduated from the Moscow State Academic College of Choreography (class of Alexander Prokofiev) and immediately joined the State Academic Bolshoi Theatre. In 1991 graduated from the Moscow State Institute of Choreography and in 2006 received his second degree (B. A. in arts with distinction) at the Moscow State University named after M. Lomonosov. 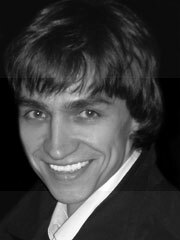 In 2008-2011 Sergey Filin was the Artistic Director of Ballet of the Moscow Academic Musical Stanislavsky and Nemirovich-Danchenko Theatre. In only three years under his leadership the theatre ballet troupe has become one of the best in Russia and its repertoire along with classical and theatre's heritage productions has been considerably enriched with the works by major Western contemporary choreographers such as Nacho Duato, Jiri Kylian, Jorma Elo, and John Neumeier, all of them staged for the first time in Russia at Stanislavksy theatre. Now the troupe rightfully enjoys the title of the major ballet newsmaker in Russia and its dancers have won the reputation of being able to perform with excellence the most complicated contemporary choreography. As a ballet dancer Sergey Filin is a high example of classical romantic dance, which combines virtuoso technique with elegance and aristocratism of his performance style and represents one of the best chapters in the history of the Bolshoi ballet. Sergey Filin created major roles in over 30 ballets by Russian and Western composers. In 2011 he became the Artistic Director of Ballet of the Bolshoi Theatre of Russia.